First touch soccer training is a very important part in every soccer players training routine. Doing activities with the soccer ball on a daily basis will greatly improve young players first touch on the soccer ball. Having a good first touch on the ball will allow the player to get out of small spaces, or trick the defenders with the first touch turn or pass. This creates more goal scoring chances, and keeps the flow of the game exciting. Players who do not have a good first touch on the soccer ball will take too many touches trying to bring the ball under control, giving the other team time to organize, and take the ball away. Learning how to control the soccer ball with the first touch, will lead to creating more space for the players which allows for more time on the ball without pressure. Juggling the ball will improve the players balance and coordination with the ball, as he/she hops on one foot maintaining balance, and controlling the ball with the other foot to keep it in the air. Juggling helps with footwork, because of the foot and ball coordination required to juggle the ball. It is one of the simplest ways for players to develop various skills, and have fun with the ball. This is a fun and simple game. You do not need loads of equipment. Soccer ball and players can train off the wall, garage, or rebound goal, having a good time with the ball always coming back. Every soccer drill should be done with both feet. Encourage players on using their weaker foot. Use this simple first touch soccer training drill to practice control and movement. Adapt and get creative with this or any soccer drill. Split players into groups of 2, with one soccer ball per group. Player with the ball will start this drill by passing the soccer ball through one pair of cones, using the correct technique (toes up, ankle locked, firm pass on the ground). Player receiving the soccer ball cannot pass the ball back through the same set of cones. 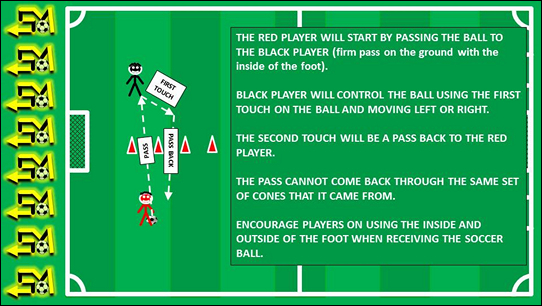 Player will have to take one touch to the left, or right, and pass the ball back through a different set of cones. Get creative and adapt different rules and ideas to make any soccer drill more interesting and faster paced.